You are here: Sothink.com > Sothink Tutorial Centre > SWF Decompiler for Windows Tutorials > How to convert Flash to HTML5? With Sothink SWF Decompiler, you are able to convert Flash into HTML5 for use. In this tutorial, we will illustrate the detailed steps for you. Your attention is greatly invited! 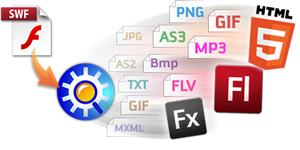 Provide a much Quicker way to build your own flash animation, powerful but easy-to-use. Load the relevant SWF into Sothink SWF Decompiler for preview. Click on Export HTML5 button to launch the relevant export wizard window. You can click on Browse button to define the output directory for new .html file. Click on OK button to start the conversion process. After the exporting process has been finished, please go to the directory you specified to preview .html file. Let's preview the exported .html in browser now. Now the whole converting process is over, it is very simple to convert Flash into HTML5 with the latest version of Sothink SWF Decompiler! Play rash movies in HTML5 compatible browsers. Dedicated to SWF decompile for over 10 years. Support Flash CS3/CS4/CS5/CS6 and ActionScript 2.0/3.0.